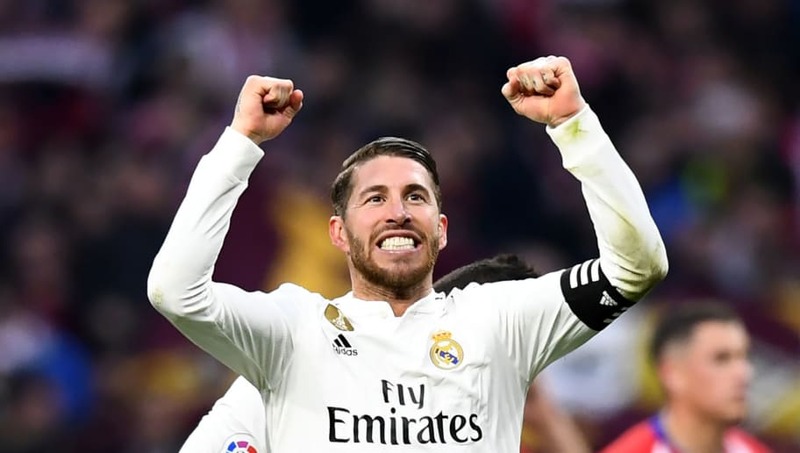 Real Madrid captain Sergio​ Ramos has claimed that VAR is a fair system, following its role in his side's 3-1 El Derbi Madrileño win over Atlético Madrid. The video assistant referee played a pivotal role in the fiercely fought contest, and first came into action to confirm Antoine Griezmann's 25th minute equaliser, which was close to being offside. VAR then controversially awarded Real Madrid a penalty, which Ramos converted, but denied Atléti a spot kick after Los Colchoneros loanee Álvaro Morata was adjudged to have gone down too easily. The Chelsea man also had a goal ruled offside by the system, which was another close call. Speaking after the ​big win, Ramos, a ​previous critic of VAR, spoke glowingly (via ​El País) about the system, stating: "The VAR is pretty fair; I am very much in favour. They (​Atléti) pushed us well and they did us a lot of damage. But the game lasts 90 minutes and we have managed to play wisely to get the victory. "​La Liga is still alive. There are a lot of points left to win. Smaller teams have created danger and stolen points in circumstances where it seemed impossible. Of course we will fight for all competitions, and La Liga motivates us a lot. Atléti boss Diego Simeone offered a gracious response (via Goal) to suggestions that poor VAR decisions had lost his team the game, and said: "I do not usually talk about the VAR. It will clearly improve for the good of everyone. I absolutely do not believe that we have lost because of VAR." Meanwhile, ​Real Madrid manager Santiago Solari claimed his side's performance was their best since December. The ​Los Blancos midfielder, who famously crossed the divide by leaving Atléti for Real back in 2000, said his side put in a well-rounded performance, with both the attack and defence contributing to the victory.